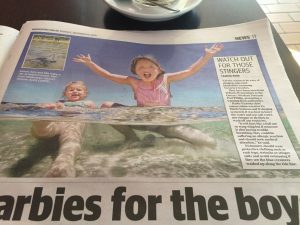 Did anyone see the article in the Herald Sun today about watching out for aquatic animals at the beach? What timing! This is a topic that we are educating our students about THIS WEEK. In the aquatic animals curriculum this week our younger swimmers learn about not touching blue-ringed octopus, jelly fish, sting-rays, and syringes. And our older swimmers also learn about the first aid treatments for stings and bites. We hope you enjoy the educational activities we include as part of our program. Does your child know not to touch jelly-fish? Would you know what to do if your child got stung by a jelly-fish? BOOKINGS FOR SWIMMING LESSONS IN 2017 ARE NOW OPEN! They just opened yesterday. If you’d like to join the fun in the water CLICK HERE for more information on the swim school or phone us on 98952300/98795777 to book. See you soon!